Snack Girl has been asked about the healthiest oils a bunch of times and keeps dodging the question. Why? There is a lot of discussion in the medical community about oil, and there isn’t a strong consensus probably because different vegetable and nut oils have received different amounts of attention. Everyone does agree that using a vegetable oil is healthier than lard (meat fat) because the oil is not packed with saturated fat (bad for your heart). Also, chefs use different oils for different dishes because some oils degrade at high temperatures so you cannot use one oil for all of your cooking. My advice is to fill your pantry with a variety of oils and hope one day that the health experts will find a panacea to end all of our oil dilemmas. Many of you have ended your oil dilemma by not using any vegetable oil because it is a processed food. I find that commendable, but you are going to have to pry my extra virgin olive oil out of my cold dead hands. 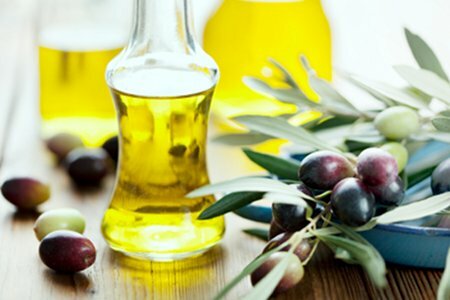 Extra-virgin olive oil (EVOO) has been important in scientific studies of the Mediterranean diet. It is a monounsaturated fat and research shows that monounsaturated fats (MUFAs) help keep “bad” LDL cholesterol low and boost levels of “good” HDL cholesterol. In addition, EVOO is high in antioxidants called polyphenols that have been linked to heart health. Numerous large, long-term studies have demonstrated a powerful association between relatively high dietary intake of MUFAs, and reduced risk of abdominal obesity, diabetes and heart disease. Canola oil generally doesn’t have many antioxidants, as olive oil does, but it does have a relatively long shelf life. In addition, canola is the richest cooking-oil source of alpha-linolenic acid, an omega-3 fat that has been linked to heart health. Walnut oil, avocado oil, sesame oil, and macadamia nut oil are examples of expensive but healthy oils that should not be cooked but added to your salad dressing to get essential nutrients and fats. Keep these in the refrigerator to keep them from going rancid as they are delicate. Vegetable oil is a mix of whatever is left over and can contain oils that you want to avoid. Always try to pick canola or another “named” oil before you buy generic vegetable oil. Partially Hydrogenated Soybean oil and Palm oil are found in many processed foods and should be avoided. Soybean oil is high in Omega-6 fats which aren’t as healthy as Omega-3 fats and palm oil is high in saturated fat. For more information, you can check out a segment on Dr. Oz Best Cooking Oils for his perspective. I know I am opening a can of worms here so please be respectful of each other (and me) in the comments section. I reviewed a bunch of different material to come to my conclusions and I know that I could have missed some. This is a very oily subject (he he). What oils do you use and why? How about coconut oil? I've seen a lot lately that says it's a great alternative to all of the above choices. No, not everyone agrees that vegetable oils are healthier than animal oils - they're generally less stable, and oils/fats from animals raised well (pastured/grass-fed) are actually pretty darn healthy. http://smallbites.andybellatti.com/handy-dandy-cooking-oil-comparison-chart is what I use. (Real) olive oil is a wonderful thing - when you're not using high heat. Otherwise I use coconut oil, avocado oil, or pastured lard/grass-fed tallow/grass-fed butter. I'd love to find tea seed oil, and have bought duck fat for a treat (though haven't found that from an actual trusted farmer yet). funny, I got another newsletter today extolling the virtues of extra virgin olive oil. I do use EVOO but not for high temps. For high heat I use coconut oil since it has a high smoke point. It's a medium chain fatty acid and has beneficial amino acids as well. Yes, it's caloric as all fats are. I don't use tons of it. I change it up once and awhile and use a blend of EVOO and Canola oil, one part of each! I made my pancakes with sunflower oil today. It has a high burn pt so good for stir fry but can work in salad dressing as well. Not sure how great it is I'm sure someone will give their thoughts. For the most part I stay away from oils if I can, I always get conflicting info. (Coconut oil being the latest).EVOO is my main go to. what about peanut oil? what other oil can stand up to the heat of a wok? What about grape seed oil? It has so many great properties and can be cooked at a high temp quickly allowing you to keep the important nutrients in your food. What bothers me is what I read about fake olive oil - apparently it is a big industry and you cannot tell what is fake or blended and what is not. Thank you for this post. This will be a huge help in my shopping. I never thought to refrigerate the nut oils either. I just by in small amounts and used them fast. Canola oil is a TERRIBLE oil! STAY AWAY! It's high in omega-6 fats (the bad fats) and it is NOT a good source of omega-3s! Any omega-3s that it did have are oxidized by the violent, high-heat processing necessary to make the oil. Thus, they are actually toxic. The best oils are the traditional oils that our ancestors used for generations. This includes coconut oil (the BEST one! ), extra virgin olive oil, real grass-fed butter, pastured lard, and grass-fed tallow. These are all full of good fats and contain wonderful flavor. Fat does NOT make you fat. I also have read canola oil is not a good oil. Any feedback on grapeseed oil? Sesame oil? I too love using coconut oil for baking breads and I use it for my granola. No one mentioned choosing based on flavor. Coconut oil has a great flavor. I mostly use EVOO and very sparingly use canola. I do sometimes use real organic butter. I recently purchased a recipe book that doesn't use any oil. Just add water to your pan when frying a tablespoon or 2 at a time to prevent sticking. You can actually taste the food. Of course I still use some for certain dishes for flavors, but most of the time I'll start with frying in water and just add a little toward the end. Charlene, what is the name of the cookbook you just bought? Thanks! Everyone who's asked about us an oil good, PLEASE see my link above. Super helpful. As for canola, "a canola" doesn't exist. It's very processed usually GMO rapeseed oil- but rapeseed isn't a pretty name, so they went with Canadian Oil, Low Acid aka Canola. Even when organic thus not GMO it's pretty far from the original through selective breeding and highly refined/bleached/deodorized. Bleh. I use grapeseed oil for eggs. It has a slightly nutty flavor and high smoke point and from what I last remember reading nutritionally beneficial. I actually bought it to massage my baby at first but didn't like it for that and started cooking with it!